« Did Joe the Plumber Kill Pajamas Media? Spring Training sure starts early for Japanese baseball pitchers. Oh … wait. February 3rd is actually Setsubun (Bean-Throwing Ceremony Day) in Japan, the day before Risshun, the traditional start of spring. Some folks dress up in oni (demon) masks so people can throw fuku-mame (“lucky beans,” roasted soy beans) at them and shout “Oni wa soto, fuku wa uchi” (“Demons out, luck in!”). Other customs include eating one lucky bean for each year of your age, eating uncut ehomaki rolls (a type of sushi) and rice cakes. There are gatherings at Shinto shrines, Setsubun-e, where dignitaries or celebrities throw beans and rice cakes to the crowd (catch and eat them for good luck). The symbolic “spring cleaning” customs derive from old lunar calendar ceremonies. These rituals seem exotic to many Americans, perhaps because Japanese spring traditions involve absolutely no weather-prognosticating rodents whatsoever. Bloggers Ad Blankestijn and Cathy Frances have written about Setsubun. Children may enjoy Rintaro Uchida’s book or this cartoon by Hashimoto Miki. 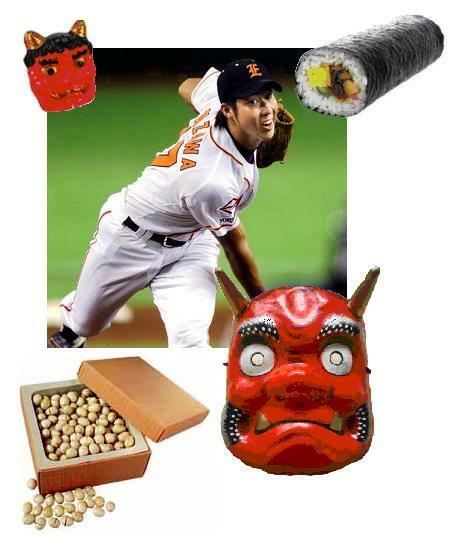 This entry was posted on February 2, 2009 at 11:53 pm and is filed under Baseball, cuisine, festivals, folklore, food, holidays, humor, Japan, sports. You can follow any responses to this entry through the RSS 2.0 feed. You can leave a response, or trackback from your own site. Spring Training really does start early in Japan!